This is a Middle Eastern dish and traditionally they use whole chicken with the skin. Sumac is a kind of sour berry which is used in a lot in cooking which gives the food a tangy, lemony flavour and pink colour. In case you don't find the sumac powder in the place where you live, you can try out this recipe using ground anardana / pomegranate. Garnishing : Onion rings sauteed with sumac and salt. Slice the onions and separate the rings. Take a little olive oil in a pan and place the rings. Sprinkle a little sumac powder and salt. Stir fry for half a minute and switch off the gas. Cover it with a lid until you are ready to use. It cooks in the steam. 1. Clean the chicken and make slits with a knife for better marination. 2. Mix the spice powders, mentioned above with 2 tbsps of olive oil and vinegar. 3. Marinate the chicken with this paste and set it aside for few hours. 4. Line a baking tray with foil paper and pour some olive oil. Place the chicken pieces and drizzle a little olive oil on top. 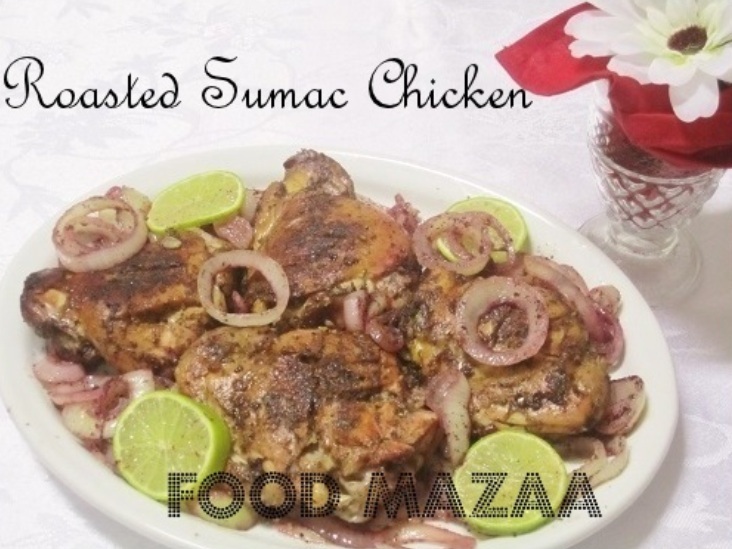 Serve this on the bed of onion rings sauteed with sumac..